Xiaomi, the Chinese phone maker that recently vowed not to surpass 5% profit by selling great handsets at near-cost, and earning on the volume, or when component prices go down with time, just issued an IPO and raised nearly $5 billion, floating 10% of the company's perceived value. The IPO process saw it officially expanding into the West, with stores in major European markets opening - warranty, local LTE bands, support and all. The CEO also mentioned that they have plans for the US markets, where Xiaomi has only been officially selling some of its accessories so far. Given the current trade spat and an overall tense situation with Chinese companies like Huawei or ZTE that also sell telecom equipment, and are under fire from US intelligence agencies, one would think this is an impossible task, but Xiaomi may have a trick up its sleeve. After filing for regulatory approval of a completely new brand in the EU, called Pocophone, it filed for the same device with the FCC on this side of the pond. 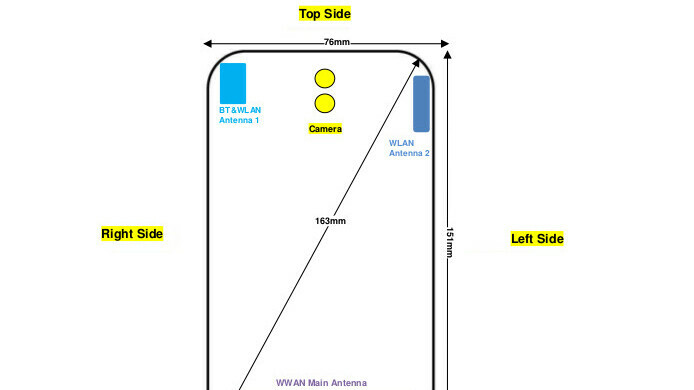 The FCC filing is complete with a sketch showcasing a dual vertical rear camera and the dimensions of the phone, codenamed as M1805E10A. As you can see, it is 6.4 inches across, which roughly translates to a 6-incher housed in a pretty compact body when accounting for some bezel at the corners. The paperwork also mentions that this is a P2 hardware, perhaps meaning a late prototype or engineering sample, and says two models were submitted, with 6GB RAM and 64/128GB storage versions, indicating an upper midrange or a flagship gear. The gear is listed with 256QAM LTE, and GNSS GPS + GLONASS + Beidou + Galileo) support, meaning it might have the same Snapdragon 845 chipset and unique dual-frequency GPS like the Mi 8, adding water to the flagship rumor mill. The rest of the specs are a mystery, but the latest MIUI 9 software is on board, and the sheer fact that Xiaomi has filed it under a new brand, not its usual Mi flagship or Redmi midranger titles, speaks volumes about the company's intentions. Appearing under a brand new and seemingly unrelated name in the US is a trick that Huawei used successfully with its Honor subsidiary which hasn't been under scrutiny from US authorities compared to the Huawei brand, so Xiaomi may try to swim to US shores on the Poco raft this time around and see what happens. The US is not the biggest smartphone market out there, but it is certainly the most visible media-wise, and the wealthiest when it comes to dollar spending in and around phones and mobile services, so Xiaomi has every incentive to try and pierce through the US red tape. The Poco phone has a vertical dual cam situated in the upper rear middle, so it's neither in the Mi 8 family, nor the Mi 2s flagship, but a brand new device, it seems. I would rather they bring over the mi mix brand first, but will wait and see what the pocophone is about. Xiaomi flagship are better than iPhones in almost ever aspect. But still they cost less than half that of iPhones. Xiaomi flagships don’t have better cameras, processors, support, security, etc. They are literally inferior in every area except value, battery life, and charging speed. Whomever upvoted you here is entitled to their opinions though. Just price and battery CAPACITY, as already said, one iPhone now, can last at least 5 Years (iPhone 5s), Xiaomi phone's can last too, but without a proper support, I'm typing this from my Redmi 4X. Who came up with a silly name like Pocophone? Pocophone Mix4 just doesn't sound right. Then again someone thought Goophone was a good name too. Good strategy but it's had limited success for the Honor brand as they're still not available from Carriers. Xiaomi make excellent phones though and if given half a chance they'll sell very well in the US. Carriers would make the phones cost go up.. (Middle men need to make money too) But, yeah.... Pocophone.. Excuse me, is that the new Pocophone? Why yes, it is.. um no. I think Chinese people need to let non-Chinese check the names they want to put on their products outside China. It seems that many names that sound weird to non-Chinese, usually sounds great to the Chinese. If Xiaomi are releasing in US. They gonna be sued by Apple directly. Xiaomi have launched in multiple European countries and haven't been sued by Apple and Apple aren't shy about suing anywhere any time. You don't know what you're talking about. More you don't have a clue about Xiaomi history and how suing works. Xiaomi just started selling phones through carriers in MAY 2018! I started to use MIUI beta on HTC Desire before even Xiaomi released any products. They are called "Apple of China" for a reason. Guess what reason? Nothing you have said has anything to do with patent or copyright infringement. Apple have already sued Xiaomi once and that was only over the use of the name MiPad for their tablet. If they had cause to sue for anything else they certainly would have done so by now. Those are FACTS not perceptions. Apple lawyers are preparing for war once these Chinese start setting up shop lmao.